Private music lessons are not available for online registration. Please call 847-360-4740 to arrange lessons. Or email Debra Carl, please include a your name, a phone number and what instrument you are inquiring about. 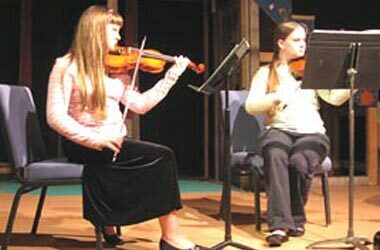 Jack Benny Center for the Arts offers five sessions of eight-week lessons each year. Please call the Center at 847-360-4740 for dates, times, and availability of lessons. Jack Benny Center does not rent instruments or sell music books. Students must be able to practice lessons on a daily basis, have the recommended music book and instrument. Some small group and ensemble lessons may need to be combined to meet minimum registration. Students are called one week before lessons if class has not met its minimum. Scholarships – Grants, endowments and memorial funds as well as fundraising efforts of community organizations have allowed the center to provide partial scholarships to a limited number of students in art, theatre, dance, and music. Scholarships require a registration form plus additional paperwork that includes a financial statement, two letters of recommendation, a scholarship form, and a volunteer application and agreement. A link to the required paperwork is provided below. For a Scholarship Application, please click here. Fees are based on one-half hour private music instruction for an eight-week session. Fees will vary between $128 and $180 (resident fee) based on the faculty member. Please add $5.00 for non-residents per each session. Payment is due at least one week prior to the session start date. Any questions regarding balances must be made between the hours of 10am and 5pm, Monday through Friday. Click HERE to see the Private Music Fee Matrix that is in effect starting the Spring 2015/2016 Session. Those families on a payment plan may pay one-half the fee at registration- at least one week prior to the session start date and pay the balance on or before fourth week of the session. Please contact the Center at 847-360-4740 if you need to make other arrangements for payment. Parents/Students should call the Jack Benny Center at 847-360-4740 if the student will be absent. Please add us to your email address book. If a call is not made at least 24-48 hours before your lesson, it may be considered an unexcused absence by the instructor. Private music is not available for online registration, please call 847-360-4740 to register and for more information. Instructors are required to make up lessons or classes that they have missed. Credits may be issued in private lessons if a lesson cannot be made up. If the student misses a lesson, the instructor determines whether or not a credit is owed (excused or unexcused), if the lesson cannot be made up. In certain circumstances, a pro-rated fee will be allowed. You must see the front desk staff for all inquiries. All faculty are independent contractors, please review their practices/policies with the instructor and inquire about all possible credits that are owed to your child, if necessary. Faculty will instruct students on the purchase of music books and other supplies needed for lessons. Instrument rental is the obligation of the student. The Waukegan Park District does not rent instruments. Please click HERE to download a .pdf of what books the instructor typically teach from. Lesson registration is rolled into the next session unless you contact us that you are canceling lessons. School year students receive priority over summer students in the fall. Summer students have priority over the waiting list students. Cancellation of lessons should be made in a timely fashion. The center carries a waiting list and as a courtesy to our faculty we would like to keep their schedules full. Students interested in practicing before or after your lesson or during our open hours may do so at no additional fee. Please call in advance for studio availability. Non-students pay $5 per hour. Parents are to pick their child up by the time the child’s lesson is scheduled to end. If students are picked up late, parents will be assessed a late fee. Parents will be charged a late pick-up fee of $7 for every 15 minutes or a fraction thereof. If you are late picking up your child after your scheduled pick-up time, the fee assessed is per child. (Even if in the same family). Example: 6:01-6:15pm=$7; 6:16-6:30pm=$14 Parents who are late picking up their child from a program may be asked to leave the program. If a child is not picked up in a timely manner after the end of the lesson and the staff is unable to reach an individual at the home phone or emergency contact, our procedure is to call the Waukegan Police Department for police assistance.